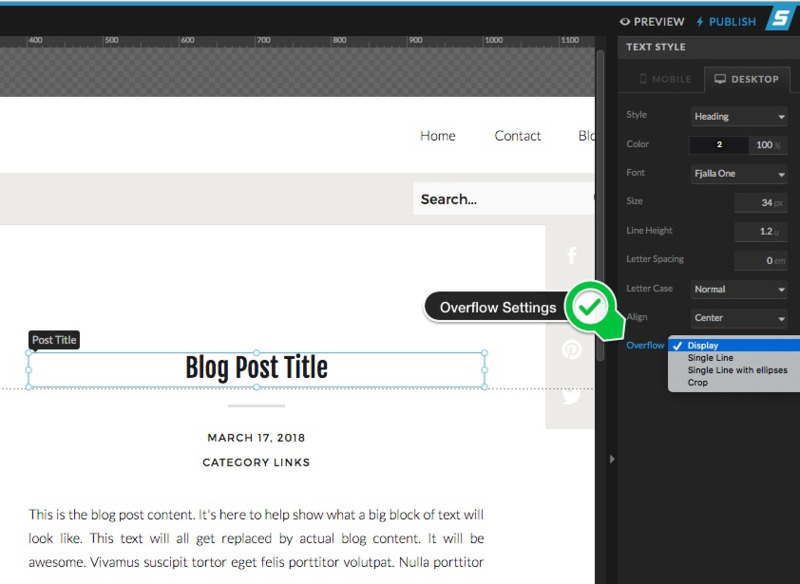 Add a text box to your layout in the position and style format you want it to appear on the blog. Tip: We suggest including placeholder text inside of the box to see how a post title with a few lines or a post excerpt with a paragraph of text might appear. 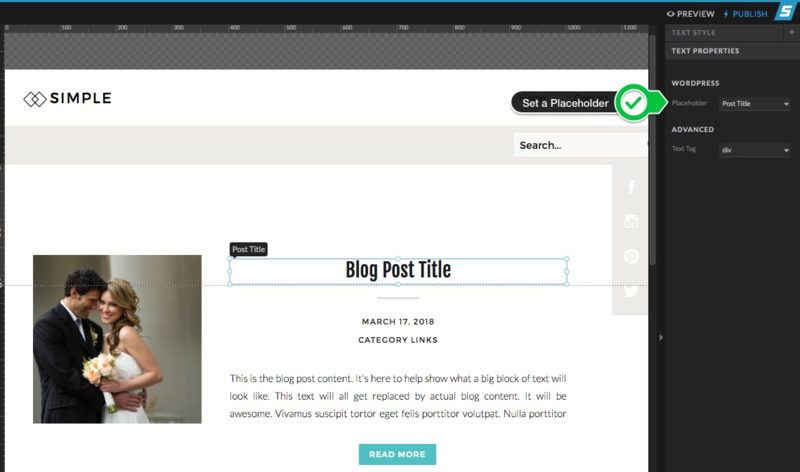 Assign a placeholder from the Text Properties > Wordpress Placeholder setting. For most placeholders the text inside of the box will get replaced by the blog content when it's live on your blog. If the content is longer than your placeholder the text will wrap based upon the width of the text box. In some cases you may decide to adjust the Text Overflow settings to Crop the text or set to display a Single Line. Most photographers want a featured image shown for each blog post. To display that image from the post you can add any image to your design and then assign it as a featured image. Add an image to your layout. Make sure the image is placed in a canvas set to Wordpress: In Post Loop. Select your image and under the settings check the box Wordpress Featured Image. The Static Content setting will be the default for any new canvas placed on a blog template page. This setting is typically used for headers, footers, sidebar, pagination links (next/previous), comments & contact form canvases. These two types of canvases are similar to each other with the primary being In Post Loop and Next Post Start only being used to tell Wordpress when to switch post information between other In Post Loop canvases. 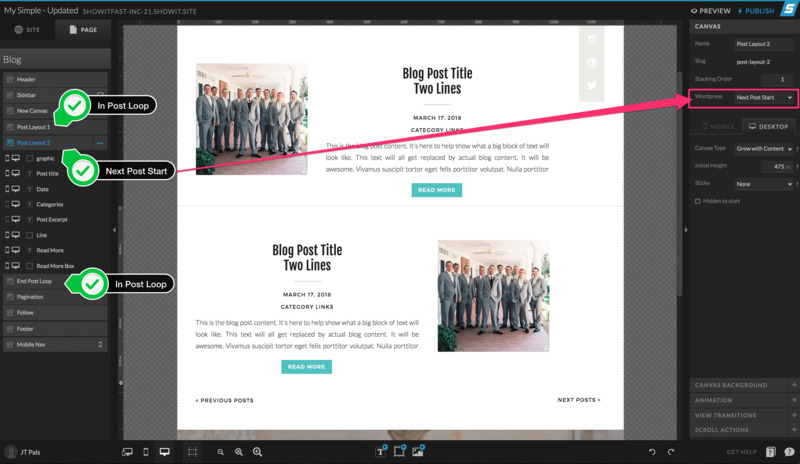 In Post Loop will be used for canvases containing any standard post information such as: Post Title, Post Date, Post Categories, Post Tags, Post Excerpt & Post Content. These canvases are automatically repeated on a Post List page. If you are creating alternating post layouts (see image above) in a repeating post list you will also use Next Post Start to let Wordpress know when it should switch post information when replacing placeholders in the design. Next Post Start should always be followed by another In Post Loop canvas as shown in the screenshot above. 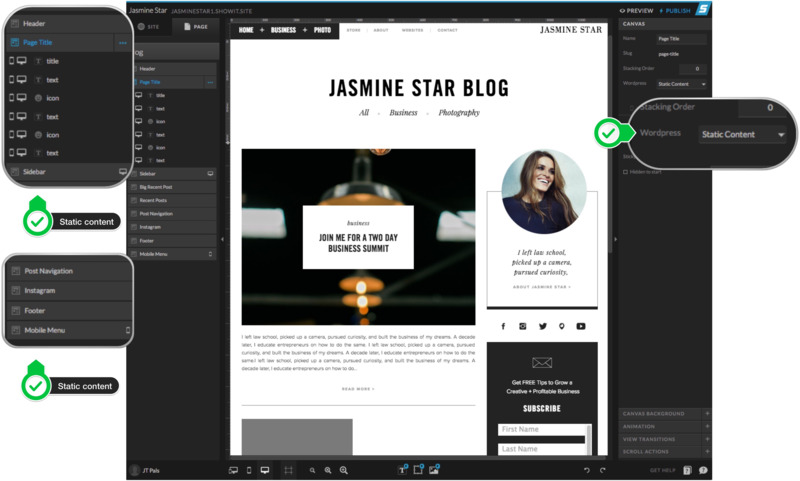 Since your design is created to hold post content that will dynamically change, your design must also be setup to flex based upon the information that gets placed into your design. This canvas type will automatically expand it's height to accommodate the content that is being loaded into the placeholders. This is especially useful for canvases containing placeholders like Post Title, Post Excerpt, Post Content, Comments, Comment Form, Next/Previous Post. Tip: This setting is independent for Mobile and Desktop layouts so be sure to check the setting on both. If a canvas is growing with content you may also make use of Vertical Locking if an object needs to remain at the bottom of a canvas.